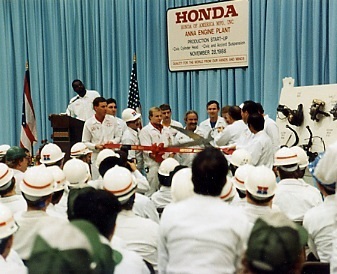 Foundry Projects | Honda Motor Company Disa Foundry - Mouat, Inc.
Mouat was awarded the contract to design and build a greenfield Disa foundry to produce castings for Honda Motor Company at the Anna Engine Plant location. This turn-key project for Mouat began at the concept development stage and concluded after start-up. Mouat provided general arrangement engineering for the overall facility and detailed engineering for the melt system vault, equipment foundations, sand system and sand tower structure and equipment. The sand system designed by Mouat provided prepared sand at a rate of 250 tons per hour. The electric melt system installed melted at a rate of 40 tons per hour resulting in production of gray iron engine blocks at a rate of 20 tons per hour. Responsibilities also included the procurement and installation of the Disa molding machine, melting furnaces, sand processing equipment, casting handling equipment, environmental systems and electrical controls. The safety and cleanliness of this foundry set standards in the industry from the sand system to the environmental systems. Automation was also a high priority for this Disa foundry. 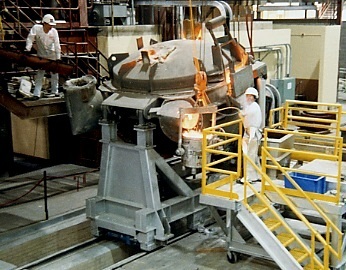 The automated pouring furnaces, installed on the 2070, provided for more control of the pouring rate and resulting in lowering casting defects.